One of the biggest differences I encountered between the big brands I worked on during my early career, and the ambitious growing businesses I’ve worked with over the last decade, is budget. My marketing budget in my last client-side marketing director role was £1.1 million. The marketing budget that many entrepreneurial businesses dedicate to marketing is, um, £0 – or thereabouts. Whilst for many this is a result of simply not having the money in the business, many will wear their ‘no marketing budget’ status as a badge of honour. For others, this is more of a lack of confidence in generating a return, than not having any to spend. 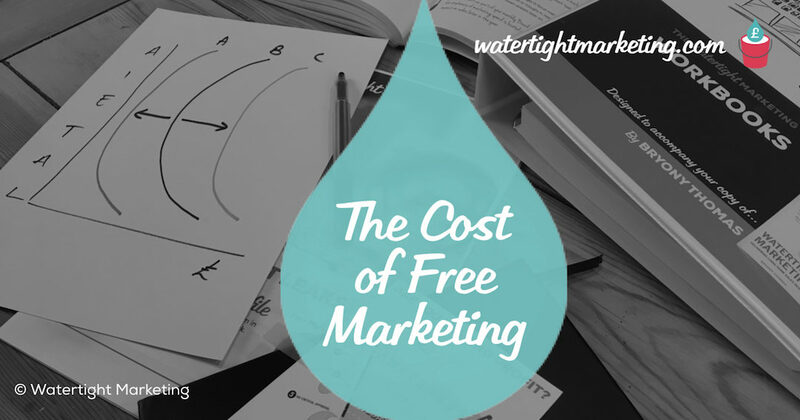 Is marketing ever really free? The first myth to bust here is whether any marketing technique is ever actually free. Making use of social media, writing a blog, creating content, sending emails, working on your SEO, attending networking events, and building relationships with referrers all take time. If these are things you, or someone in your team, is doing whilst believing that you don’t have a marketing budget – it tells me that you are massively underestimating the value (and cost!) of people’s time. I would encourage you to work out what these people cost your business, and the opportunity cost of using this time for marketing rather than on billing activities. From there, you can use our Budget Shape method to assess how and where this is being ‘spent’ when they work on your marketing. See: Six steps to a strategic review of your marketing budget? The only real exception to this is those lovely unexpected referrals that come your way because you’re good at what you do, and happy customers like telling people about you. Though, I might argue that this most often happens in organisations that invest in proactive customer communications… which is marketing. And, if you are genuinely getting referrals simply by being good at what you do, adding a bit of structure to this (called marketing) would almost certainly get you more of them. There are also a number of marketing tasks that take a fair amount of initial time (or money) and then pay you back for many years without further expenditure. These are investment projects, like getting your brand professionally designed, building your website, creating evergreen content, writing a book, etc. In our Masterplan programme, we call this Marketing Leak Tweaking. Head to Part Three of the Watertight Marketing the book for a run-down on these sorts of investments. What I think most people usually mean when they say they spend no money on marketing is that they don’t use paid channels. For example, they use social media – but don’t pay for social advertising. They secure press coverage – but don’t pay for press ads. They attend or speak at networking events – but don’t put on their own. They work on SEO – but don’t pay for search advertising. This is good stuff that we should all be making the most of… particularly to amplify and extend the reach of the things we do spend money on. But, is it a good idea for a growing business to only do this… with no paid channels in their mix at all? Should a growing business do their marketing for nothing? If your business is only doing the sorts of things described above, without a marketing budget to point to, is this something to be proud of? In a solo-entrepreneur business, and in early start up phase, I’d probably edge towards answering yes. In a business that seriously wants to scale, I would confidently say no! If you are a solo-entrepreneur, particularly one with expertise that you sell, you can definitely build a nice lifestyle business by choosing to invest your time, rather than hard cash, into making the most of free routes to market. Do those free speaking engagements, get active in social media, share your expertise in blogs, videos, etc. This is exactly what I did in my first 18 months as a time-for-money marketing consultant and got to a six-figure income within just six months. For a bootstrap or kitchen table start-up, I’d say the same. Squeeze every drop! This can mean that you end up a few miles off your desired destination, or that the lift you were waiting for simply doesn’t show up. Now, I’m a big fan of lift-sharing if someone is heading where I want to go – but I wouldn’t hitch-hike to an important business meeting that I wanted to be sure of getting to on time. If you have goals and timelines to meet… you need more control. Most free channels are borrowed. You’re speaking at someone else’s event. You’re relying on people hitting their share buttons. This makes it hard for you to rely on it, or vary the flow. In the Watertight Marketing analogy, you’re relying on somebody else’s Tap – and it’s in their control turn it up, down, or off altogether. If you’re serious about sustainable sales growth, or you want to convince an investor to get on board, this is going to cause you problems. If you are in the step-up phase of business growth, or your business has employees to feed or shareholders to satisfy, you really need your own car. This means that you need a marketing operation mapped to every step of the sale, and you need to fuel it with paid marketing activity that is proven to do the job you want it to do. Waiting for a referred lead to call you with a project? Putting £2000 into a paid-for ad campaign that has a proven 10:1 return? Having levers that you can adjust, without waiting on anyone else, gives you the dashboard for your own growth. It puts you in clear, calm, control of your business. So, whilst the free stuff should always be part of the mix… if you want to grow beyond the bedroom, a marketing budget really is a good thing to have. Want to know more about marketing budgets? What should you include in a marketing budget? What shape is your marketing budget?